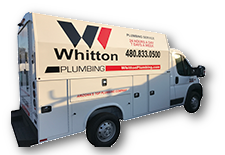 Over 75,000 Arizona households have discovered what makes Whitton Plumbing Arizona's premier plumbing company. With over 30 years of plumbing and home remodeling experience, we are one of the largest contractors in the Southwest. But our size doesn’t prevent us from paying the sort of personal attention to plumbing and remodeling needs that our discriminating customers demand. That a plumber comes from a long line of plumbers is a common boast in our industry. But in the case of Whitton Plumbing, it's more than just a boast; it’s the honest truth. Family owned and operated, Whitton Plumbing observes the highest standards of courtesy as well as service. We at Whitton Plumbing always put you the customer first, going the extra mile to ensure that all your residential plumbing needs are met. When you make a call to Whitton Plumbing, we work with you to determine the best time to dispatch a plumber promptly, based on your schedule. Using our sophisticated global positioning system, we dispatch plumbing specialists from the location closest to you, whether you happen to be in the metropolitan Phoenix or Tucson area. When you have a plumbing emergency, we have plumbers in Mesa, plumbers in Phoenix, and plumbing contractors in Tucson standing by to quickly assist you with the best plumbing solutions in Maricopa and Pima county. And with Whitton Plumbing there are no unpleasant surprises when it comes to billing. We provide you with an upfront estimate, so you won't have to worry about the sort of hidden costs and fees other plumbing companies like to charge their customers. Whitton Plumbing’s plumbers are as highly trained as our billing practices are plain and direct. We employ only those plumbing professionals well-versed in the most current, technological advances in plumbing. Whitton Plumbing ensures that its plumbing professionals receive continuous training and education in the latest quality, safety and manufacturer-certified courses. With so much skill and training, our plumbers have yet to meet a plumbing problem they can’t handle! Whitton Plumbing uses advanced technology to pinpoint leaks of water and sewer lines with minimal disruption to your yard or property. What's more, we at Whitton Plumbing do our part to ensure that your home returns to the same condition it was in before you contacted us -- minus the plumbing problem, of course. Whitton Plumbing is also committed to helping our customers reduce their carbon footprint, so we encourage you to ask about our high effeciency hot water heating systems. A tankless hot water heating system can be the first step in turning your home into a greener, more cost efficient residence. (And we all know that the Arizona desert could do with a bit more green.) Plus, going green saves green: Depending on the size of your home or office, a high effeciency water heater can knock up to $500 a year off your energy bill. And Whitton Plumbing doesn't just specialize in plumbing repair; we also plan and execute home remodeling projects, which can be time-consuming, costly affairs if you don't consult the proper professionals. Let Whitton Plumbing handle your home remodeling needs. Our unbeatable prices and unparalleled craftsmanship make even the biggest projects affordable. Whitton Plumbing will plan and execute any project, large or small, in a professional and timely manner, and we offer free on-site walkthroughs for home remodeling. Whether it’s a home remodeling project, or sinks, toilets, showers, faucets, water heaters, pipes or drains that need cleaning, repairing or installing, Whitton Plumbing executes any project and repair with professional excellence. Call Whitton Plumbing today for your free phone estimate on all your plumbing and home remodeling needs. Our services are available 24 hours a day, seven days a week.